Coolant (Antifreeze) What is it? The most common formulation of antifreeze is green in color and uses ethylene glycol as a base with anti-corrosion additives mixed in. The ethylene glycol part of the formula provides crucial anti-freezing characteristics and the additives deliver the anti-rust and anti-corrosion capabilities. Beginning with 1995 models, most GM vehicles started coming from the factory filled with an extended-life antifreeze, trademarked as DEX-COOL®. Distinctively different in appearance, DEX-COOL®, and its aftermarket equivalents, is an orange/amber color. It still uses ethylene glycol as a base, but contains a different additive package than standard green-colored antifreeze. This coolant is designed to protect cooling systems (Air Conditioning) for up to 150,000 miles or five years. Other antifreeze formulations include silicate-free for Japanese cars and phosphate-free for European cars. What does coolant do for your cars and trucks? When properly mixed, antifreeze and water provide excellent anti-freeze, anti-boil and anticorrosive properties preventing your car from overheating. Check your owner’s manual for antifreeze usage specifications. Antifreeze, when mixed at a 50/50 ratio with water, provides excellent anti-freeze, anti-boil, and anti-corrosive properties. In extremely cold environments, the ratio for standard ethylene glycol can go as high as 70% antifreeze, 30% water. With DEX-COOL®, the maximum ratio of antifreeze to water is 60/40. Although DEX-COOL® type antifreeze can be mixed with standard ethylene glycol antifreeze, DEX-COOL® loses its 5 yr./150,000 life. As such, it’s best not to mix antifreeze types unless absolutely necessary. All coolants must be diluted with water at the proper ratios and should not be used full-strength. 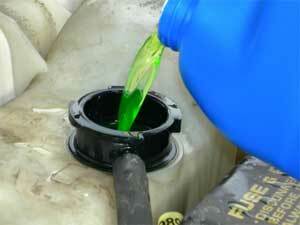 Full-strength antifreeze actually has a lower freeze point than when mixed with water. Generally, standard ethylene glycol type antifreeze should be changed every two years or 24,000 miles. Even though the coolant freeze protection may test OK with a hydrometer (freeze protection only drops with extreme dilution, not with age), the additives break down over time. When changing coolant, it also presents an opportune time to replace bad cooling system hoses.Leaking, brittle, spongy, cracked, or rotted hoses should be replaced before new antifreeze is installed. Hose clamp connections should also be checked to ensure that they’re secure and free from leaks. 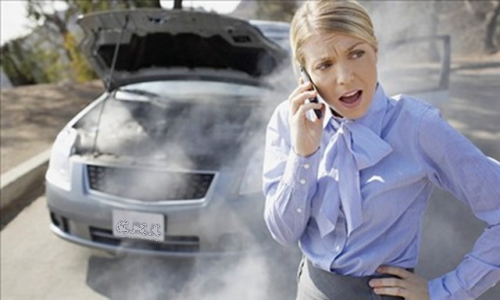 If you decide to service your cooling system yourself, use extreme caution: Opening a hot radiator or coolant reservoir/overflow tank can cause severe burns. Be sure that both the engine and cooling system are cool before you begin any heating/cooling system maintenance or repairs. Because of lower hood profiles and cramped engine quarters, it’s also possible that your car may be equipped with an air bleed for the cooling system. Unless the cooling system is bled properly, air may stay trapped in the system and cause erratic temperatures, or in extreme cases, engine or cooling system damage. If you’re unsure about any aspect of cooling system service, don’t take a chance. Have your car looked at by a professional service technician. For your convenience, the we have developed a Service Interval Schedule to help you keep track of regular maintenance. Most of the checks and services described here can be done at little or no cost. Best of all, they are quick and easy to do. We’re a Florida family-owned and operated complete automotive service center. We’ve served our south Florida neighborhoods for over 20 years with honesty, integrity and the best car care you can find.